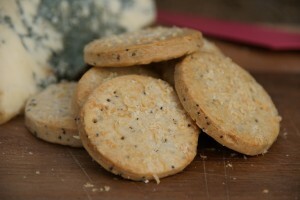 On the fourth day of Christmas The Pink Whisk sent to me…..Parmesan and Poppy Seed Crackers – perfect for your cheeseboard! 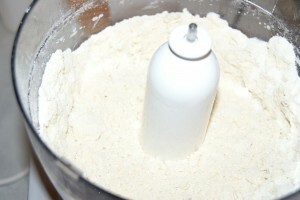 Begin by adding the flour, baking powder, sugar and onion salt to the bowl of a food processor. Pulse to mix them up well. 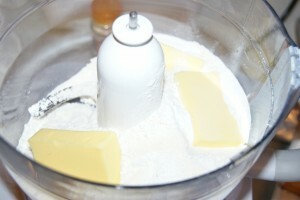 Add the butter and turn on the processor until the butter is rubbed in and the mixture resembles breadcrumbs. 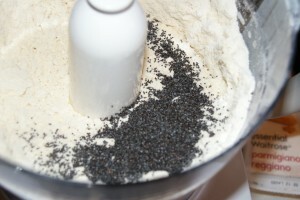 Add in the poppy seeds and blitz to mix up. 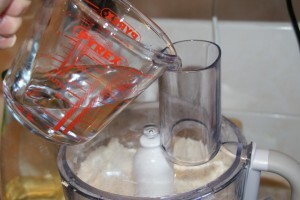 Turn on the processor and whilst running add the oil down the chute, then begin to add the water slowly until the dough comes together – you may not need all of it, you might need a little more! 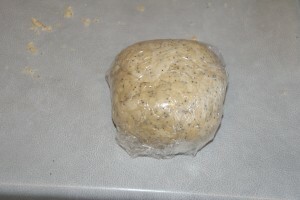 Gather the dough into a ball, wrap in clingfilm and chill in the fridge for half an hour. 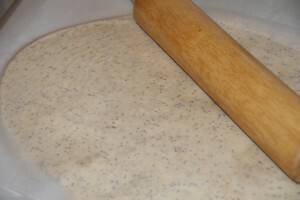 Once the dough has rested roll it out between two sheets of baking paper to about a 4mm thickness. I like crackers nice and thick but if you want thin ones just roll them out thinner! Chill in the fridge again until completely firm. Preheat the oven to 170c (fan)/190c/Gas Mark 5. 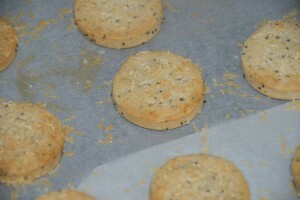 Cut out the crackers using a small round cutter and place on a baking sheet lined with baking paper. 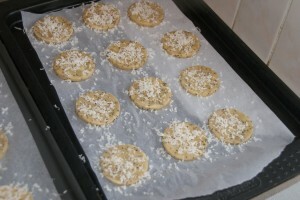 Prick them with a fork and grate the parmesan cheese over the tops. Bake in the oven for 12-15 minutes until golden and cooked right through – check by flipping them over and checking the middle of the base, if it still looks a little doughy bob them back in the oven for another couple of minutes. Remember, if you’re going for thin crackers they will take less time to bake! Once baked allow to cool for a short while on the tray before transferring to a wire rack to cool completely. 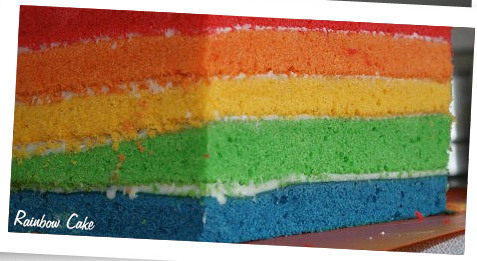 Store in an airtight container for upto one week, or freezer straight after baking if you want to make them well in advance. Once defrosted crisp up in a hot oven for a couple of minutes. This entry was posted in Afternoon Tea, Biscuit, Biscuits, Cheese, Christmas, Pastry, Savoury, Treats, Twelve Days of Christmas. Bookmark the permalink. These sound absolutely perfect and the good thing is they can be kept for a week – don’t know if they would last that long! As long as it’s a nice hard vegetarian cheese that can be grated it should work just nicely x Let us know what you go for! Yay! You are back! I bet that was a relief? 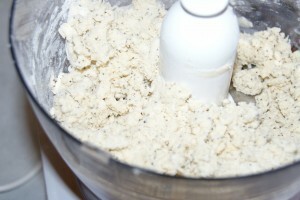 another of your great recipes that I have to make this Christmas! 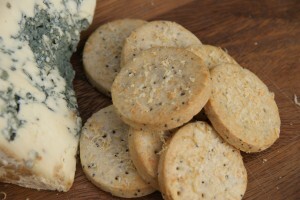 I love the look of these – parmesan biscuits are such a winner on a cheese board and the addition of poppy seeds is a lovely touch for extra crunch and colour. Yum. I am trying out your recipe using Bookhams vegetarian parmesan called Sussex Charmer. As my two children are vegetarian. I will let you know how I get on.